It is often the case that a DataPower developer will have work to do, but does not yet have a backend Service Provider to point the DataPower service at. In general, anything beyond trivial examples will need to point at something that returns a valid response. In order to satisfy this requirement, an XML Firewall can be setup in loopback mode that uses a custom stylesheet to generate a valid response. 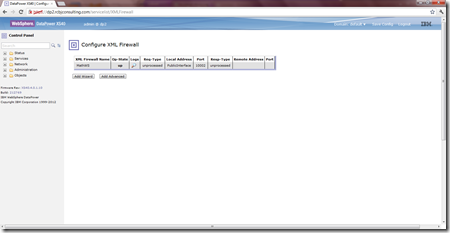 This tutorial will demonstrate how to create this XML Firewall. 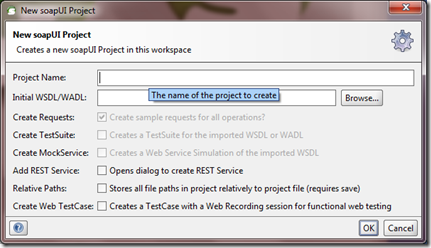 For our example, we are going to return a valid SOAP response for this WSDL. 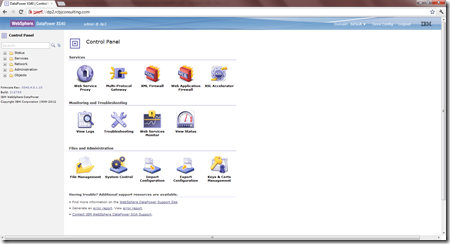 Log into the DataPower appliance and navigate to the Control Panel screen if not already there. Click on the XML Firewall icon. Click the “Add Wizard” button. Chose “Pass Thru (Testing Only) radio button. Type a name for this XML Firewall in the text field. For this tutorial, we will use MathWS. Chose “loopback-proxy” from the drop-down menu. 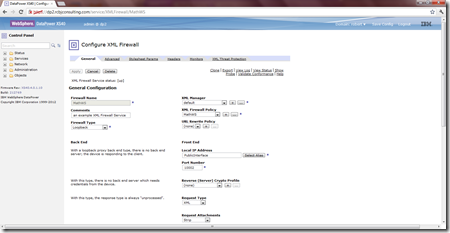 In the Device Address field, either a valid IP address or Host Alias must be added. For this example, a Host Alias called PublicInterface, which maps to the public IP address used by one of the ethernet interfaces on this appliance. The Device Port field should have a valid TCP port. For this example, we are using 10002. For now, SSL will not be used in this example. So, keep the “off” radio button checked for the last parameter. 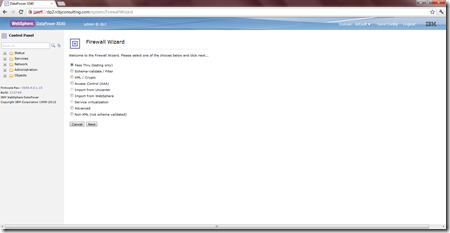 This screen lets us review the settings we have chosen in this wizard. Click the save link in the upper, right-hand corner. Click on the XML Firewall icon again. Click on the MathWS link. In the right-hand column, at the bottom, choose “XML” from the Request Type dropdown menu. Click the Advanced tab link. In the left-hand column, click the off radio button under “Disallow GET (and HEAD)”. In the right-hand column, click the on radio button under “Process Messages Whose Body IS Empty”. Click the save config link. Next, we need to create an XSLT stylesheet that will return a static response to SOAP queries. As a starting point, copy the contents of the stylesheet given in this tutorial into your favorite XML editor. Next, we need to generate a valid SOAP response. This can be done with SOAPUI. 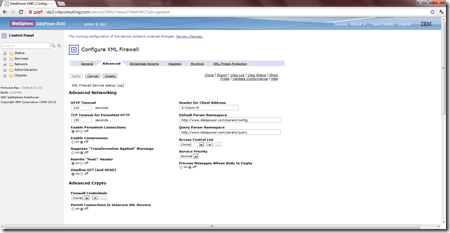 Download the WSDL to your local file system. 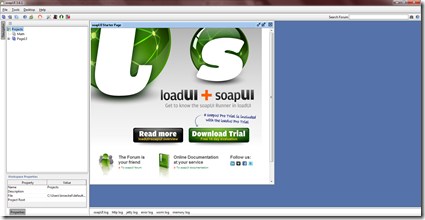 Download SOAPUI or a similar tool. Enter “MathWS” in the Project Name field. Choose the MathWS.wsdl file that was selected earlier. After some processing, a project will be created. Expand the MathWS->MathWSSoapBinding->sum->Request 1 tree. Double-click on the Request 1 node. You will see a request message with ‘?’s in place of values. Click the SOAP icon (third icon from the left) on the Request 1 window. Enter a name for the Mock Service. When prompted for “Open MockResponse editor?”, click the Yes button. We now have a valid SOAP response that can be added to our new stylesheet. 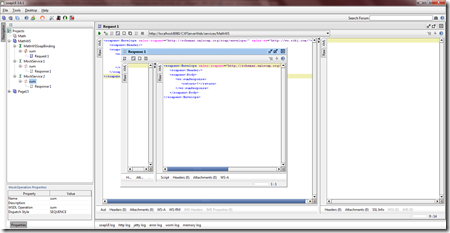 Copy the text in the Response1 window into the <template> of the stylesheet. Replace the ‘?’ with ‘6’ or your favorite number. Save this file as MathWS-Response.xslt on your local file system. Navigate back to the DataPower Control Panel in your browser. Click on the File Management icon. Click the Actions link next to local:///. Choose the “Create Subdirectory” option. Enter a meaningful directory name. This tutorial will use “example”. Click the “Confirm Create” button. You should see a subdirectory called example. Click the “Actions.” link next to the example subdirectory. The “Save As:” field should be automatically filled in with “MathWS-Response.xslt”. Select the “Overwrite Existing Files” checkbox. Navigate back to the MathWS XML Firewall configuration screen. Click on the “.” button below “XML Firewall Policy” on the right-hand side. Expand this window to give yourself more room to work. Find the round icon in the large window towards the bottom marked “Transform”. Drag this Transform Action icon onto the Request Rule between the diamond shaped Match Action and the square shaped Response Action. Double-click the the yellow highlighted Transform Action. From the Transform drop-down menu that currently shows “local:///”, chose “local:///example”. From the file drop down directly below it, chose the MathWS-Response.xslt file. All other fields can be left as their default values. Click the “Apply Policy” button. Click the Close Window link. 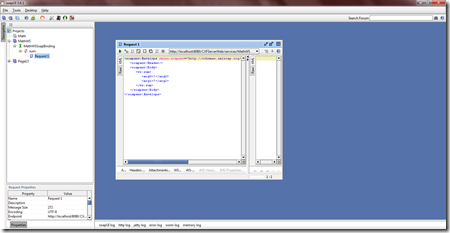 Now, return to the SOAPUI project that was created earlier. Go to the “Request 1” screen. 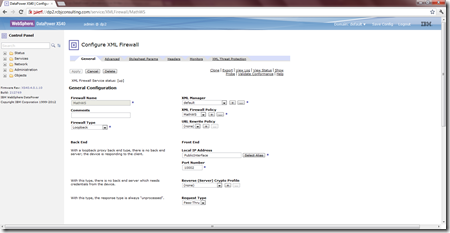 Modify the service URL to be http://dp2.rcbjconsulting.com:10002/service/MathWS (choose edit current from the drop down menu). Replace the URL with whatever is a valid URL for your appliance. You have successfully constructed a “dummy service” that can be used in the absence of a legitimate Service Provider implementation. 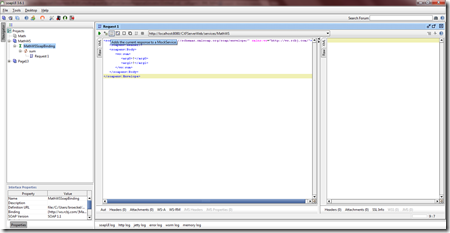 Next Post:Some Simple Updates To A DataPower XSLT stylesheet.